Enjoying the outdoors, hosting friends and family, and having a grill space for your inner grill master, with the custom deck of your dreams! 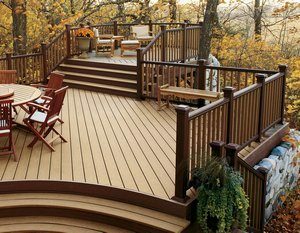 We here at Miles Bradley Building and Remodeling in Illinois want to build your dream deck this year. We will help you every step of the way from brainstorming to planning, blue prints and then building your custom deck, all while you watch it come alive. Let us show you some pictures of custom decks we’ve built in the past year for some inspiration! It’s amazing what a deck can do for a house. Not only are you increasing your property value, but you are also creating space to entertain and enjoy the great outdoors. As you can see from this deck picture, these guys took their backyard up to the next level with a Trex Trancend deck with Aluminum Rail. This house went from drab to fab overnight, and will last long enough for you and your guests to enjoy it. If you’ve ever dreamed of getting a pool, but couldn’t justify getting an in-ground pool, this is a great alternative. This family bought an above ground pool, then we built the multi-level deck around it. Not only do they now have space for the pool and the hot tub, but they also created an area to entertain guests comfortably around the above ground pool. What we like most about this design is the how the multi-level deck created a space to keep the hot tub isolated away from the elements and give the owners a little privacy. Along with providing a classy and easy accessible way to enter the pool. This was another customer who wanted to have a space to entertain guests and be able to cook out without worrying about their deck getting damaged. They wanted to utilize the Trex Transcend low maintenance composite deck material, so cleaning up after a night with guests would be a breeze. Trex is known for their mold resistant, scratch resistant deck material made for recycled material, so you know your in good hands. As you can see, the product can speak for itself when it comes to look. This particular customer wanted to have a deck that would be low maintenance, easy to clean and give them the privacy they wanted when they use their hot tub. So we built them a deck that utilizes Trex Transcend Deck for a low maintenance, fade resistant, easy to clean deck they could enjoy all year round. We included a composite wall with a gate so they could have the privacy they desired for their hot tub. We love how it came out. 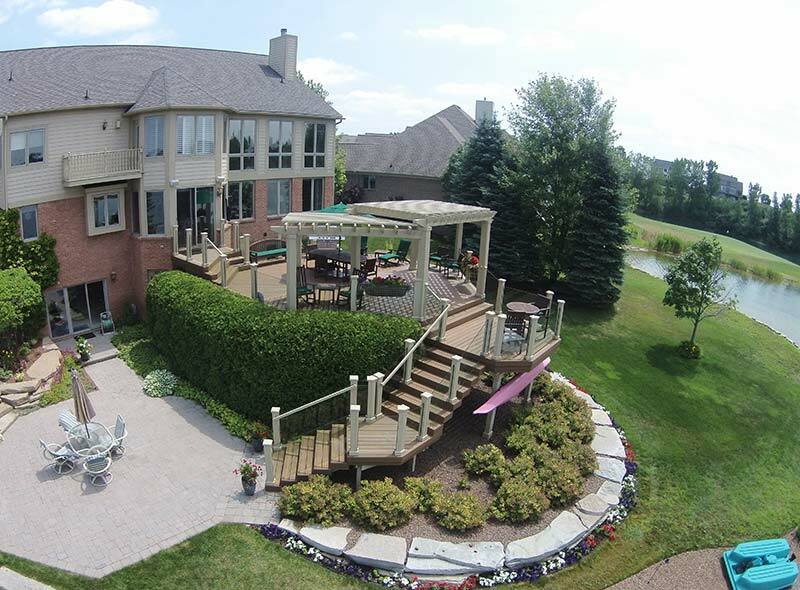 We’re not just one the best professional deck builder in Illinois (and Michigan), but we can also will help you build the gazebo of your dreams. Here you can see a job we did in St. Charles, Illinois. We helped this owner not only create a wonderful outdoor/indoor screened in gazebo space, but we also helped them build up the deck of their dreams. We custom built their deck in Western Red Cedar and complimented it with aluminum Balusters, rail lighting, and topped it off with shingles that matched their houses roof. Miles Bradley Building & Remodeling, Inc. in Illinois is located at; 3 Golf Center #403, Hoffman Estates, IL 60169. Reach us at (847) 920-7601. We’ve got the experience, skill, and professionalism you look for when building your perfect deck. If you want to start down the road to get your newest and best home accessory, we can help. Request a quote anytime on your dream deck project. Sumer is on it’s way, and with summer comes the time reconnecting with the great out doors. Why not reconnect from the comfort of your own home with a new custom built deck? Get the deck of your dreams this year with help from Miles Bradley Building and Remodeling. We’ve designed custom decks all over the greater Detroit area. We’ve picked a few custom deck projects from the White Lake area that are highlighted below from last year. Here you can see a custom built two story Trex Transcend Deck. This particular client wanted to have a good view on the second story, while allowing for space on their lower level deck for a place to entertain guests. Here is another wonderful custom deck that we put together in White Lake. It’s right on the water so we designed this deck to highlight the beautiful view of the water. We used the Trex Transcend Deck so they don’t have to worry about the upkeep and hassle of a traditional wood deck. Another great feature on this deck is the stainless steel cable rail. Sleek, clean, and allows for great views of the lake. Here is another custom built deck that was built with the Trex Transcend System. These decks make for great low maintenance backyard living. We added lights in the stair case for safe and easy travel up and down the stairs. As you can see from the bottom image, they added lighting on the deck as well. These clients wanted to be able to extend their evenings on their deck. Located In White Lake, MI. If this is the year you want to get the deck of your dreams, let us help! Contact us today, and let us help build your deck today!